The drink responsible for kicking off the vodka craze in America in the 50's. Refreshing like a Limeade with a slight bite. Pour chilled Vodka and lime juice into chilled glass and stir. Add cracked ice and top with cold ginger beer. Garnish with a wedge of lime. 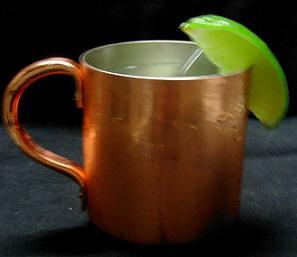 It is traditionally served in a chilled copper mug, but that's not absolutely necessary. For a sweeter drink substitute Ginger Ale for Ginger Beer and uses Rose's Lime Juice.